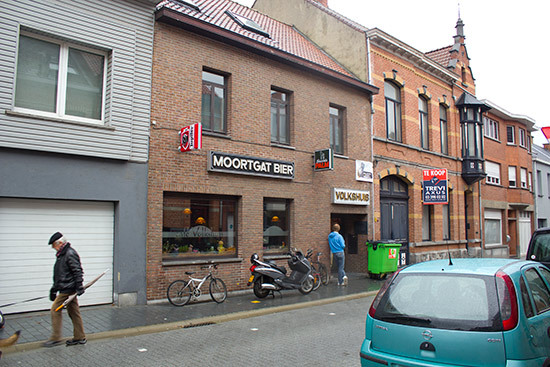 Location: Café Het Volkshuis, W. De Vochtstraat 7, Puurs, Belgium. 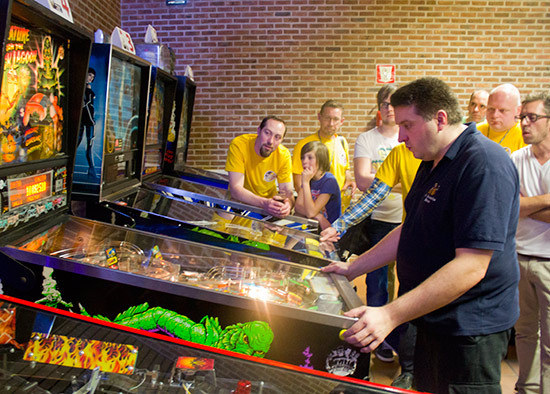 The town of Puurs lies approximately mid-way between Antwerp and Brussels in the Flemish region of Belgium, and it was here that the new Belgian Open Pinball weekend was held at the start of November. 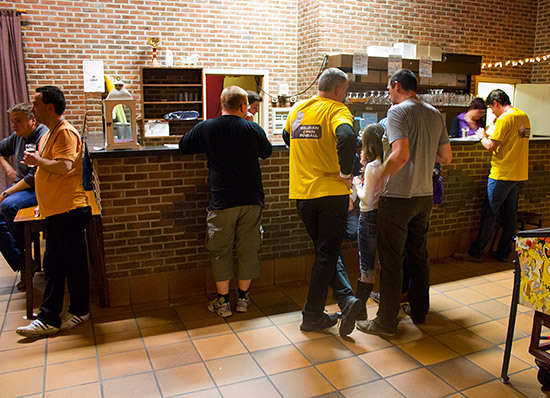 Its home was the Volkshuis café on a busy street leading to the town's railway station. As you may have gathered from the signs outside, the term 'café ' here refers to a bar more than a coffee shop or eatery. There was a good selection of traditional Belgian beers available - including several Trappist beers - as well as lagers, spirits, soft drinks, coffee and tea, while a hearty breakfast was available each morning as well. 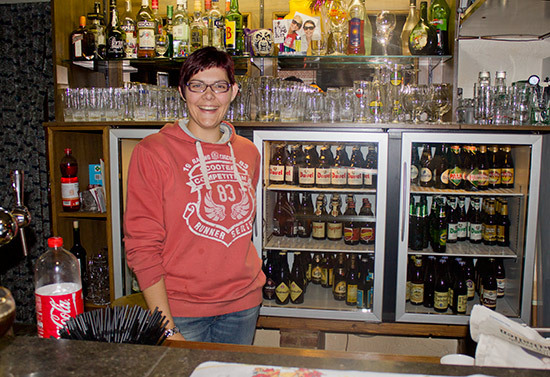 The bar lady was very welcoming to everyone taking part in the tournaments. 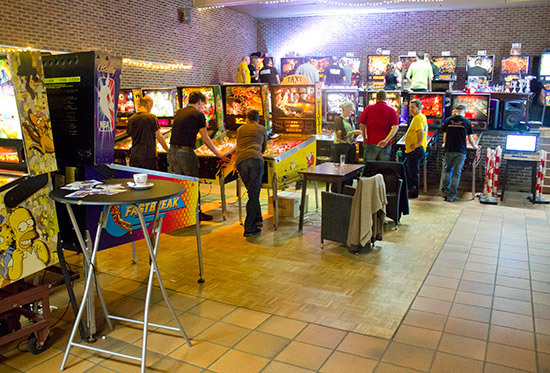 The pinballs were set up in a large room at the rear of the café. Most were on the main floor, but ten were set up on the raised stage against the room's back wall. Making an appearance on the Saturday was The Matrix from pinnovating.com. 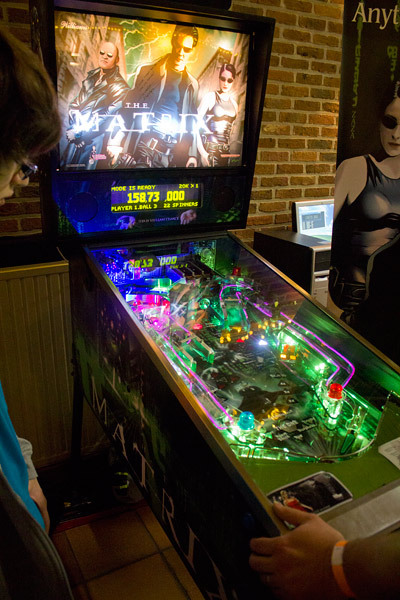 This Johnny Mnemonic conversion had been developed further from its last outing at the Dutch Pinball Open, with improved lighting effects and fully-working LE wire on the ramps. There was a queue to play it pretty much all the time it was set up. At the front of the room was a second bar which served a more restricted range of drinks but was slightly more convenient to get to. 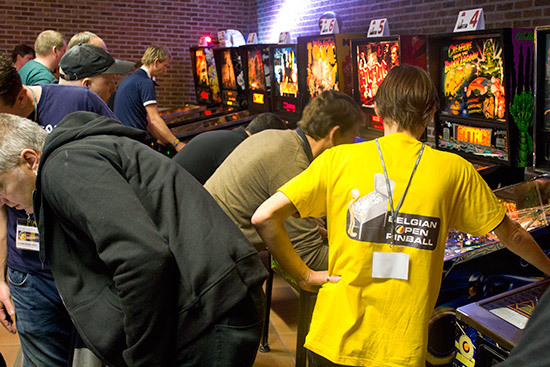 Entry to the Belgian Open Pinball cost €40 which bought entry into the Main Tournament as well as three drinks tokens, each one valid for a beer or soft drink from the bar. 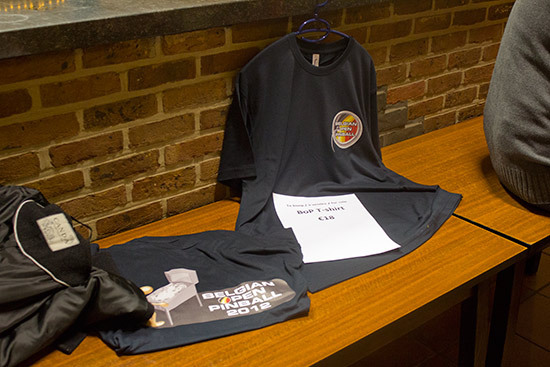 Belgian Open Pinball T-shirts were available to purchase for €18. 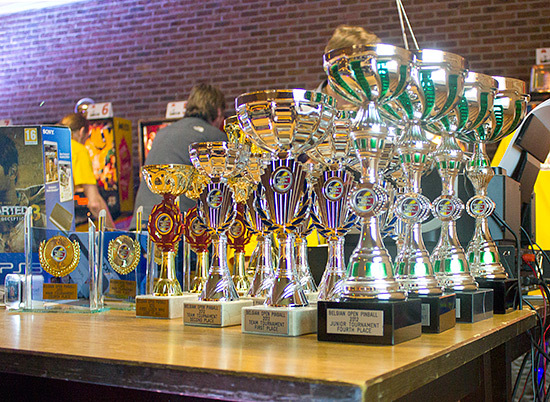 Although the Main Tournament was the chief attraction, there were three side tournaments taking place too, each with their own set of trophies. The first to begin was the Team Tournament run by Tom Geneyn which consisted of eight teams of four players and began at 11am on Saturday. 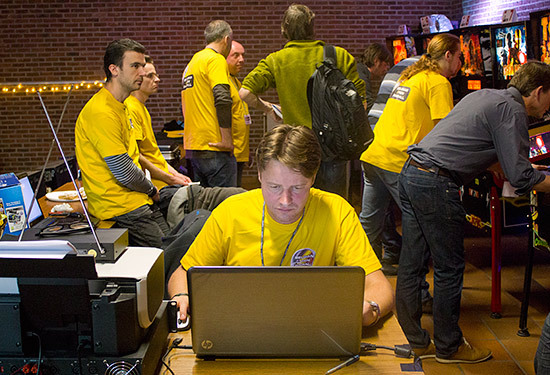 There were four Belgian teams, two Dutch teams, one from the UK and one joint Belgian and French team. The four teams were split into two groups, where each team played a match against the other three teams in their group. 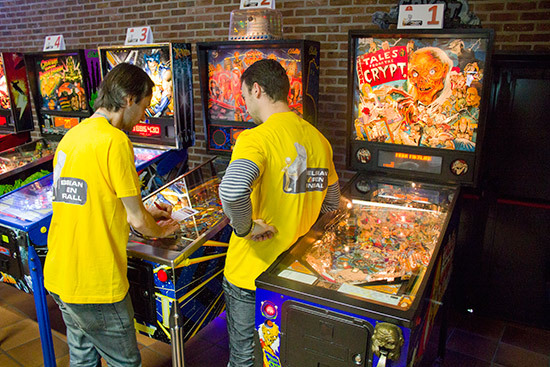 A match consisted of two players from each team playing two from the opposition in a four player game on one machine, while the other four players did the same on a different machine. 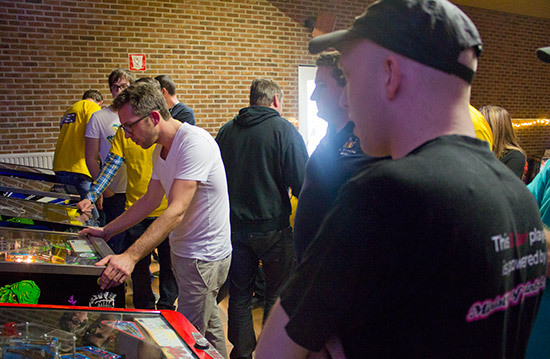 After that, all eight players took part in a four-player game where two players played at a time - one on each flipper. The top two teams from each group went through to the two semi-finals, which were played in the same way as the first round. 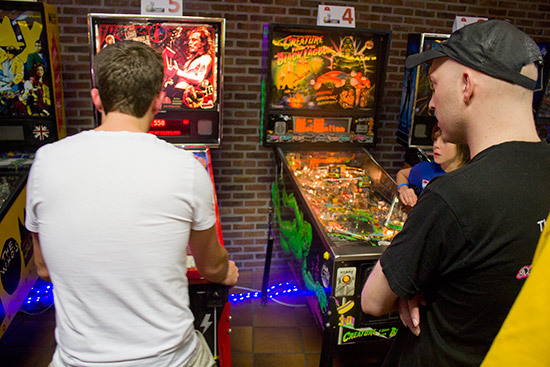 The eight machines used for the Team Tournament first round were; Stargate, Monster Bash, Transformers Pro, World Poker Tour, Batman - The Dark Knight, Pirates of the Caribbean, Bram Stoker's Dracula and High Speed 2 - The Getaway. 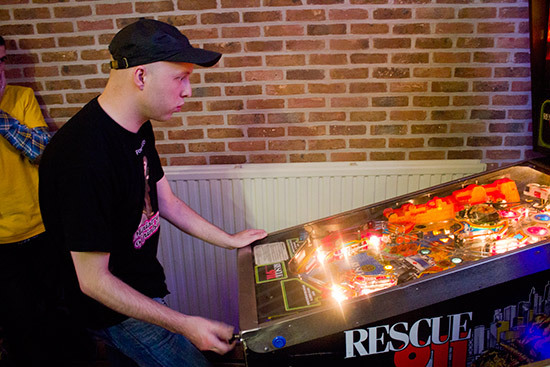 The final was between the Team Flipperen For Fun from Belgium and the Dutch Pinball Team. 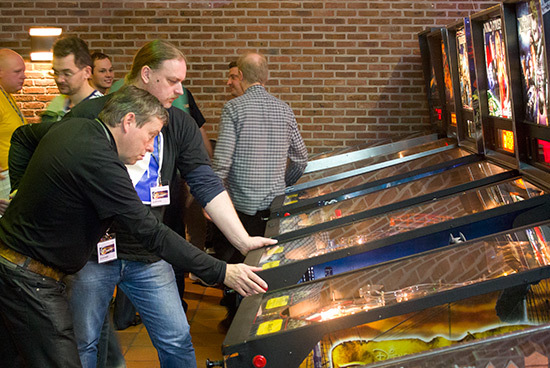 In the final it was the Dutch Pinball Team of Albert Nomden, Ad Jonker, Joska Keunekamp and Edwin Nijs who were triumphant and took home the winners' trophies. 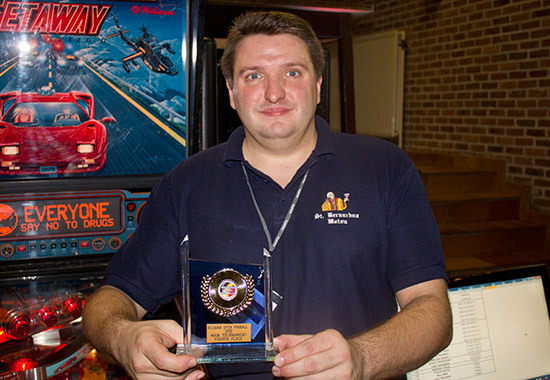 Saturday was also qualifying day for the Main Tournament which was run on this day by Evert Brochez. At this initial stage there were ten machines used - the ten positioned on the raised stage. They were: Rescue 911, The Addams Family, Congo, Iron Man, Tommy, AC/DC Premium, Creature from the Black Lagoon, X-Men Wolverine, Doctor Who and Tales from the Crypt. 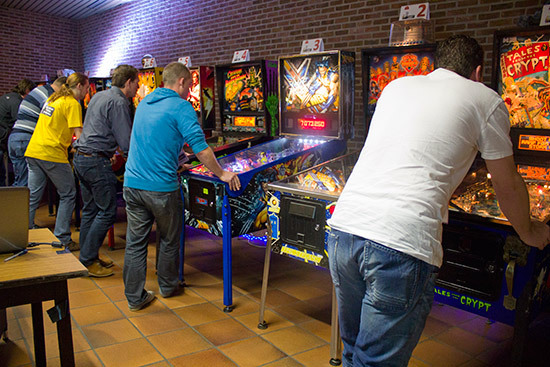 Competitors could choose any six of the ten available machines and play a single 3-ball game on each of them. 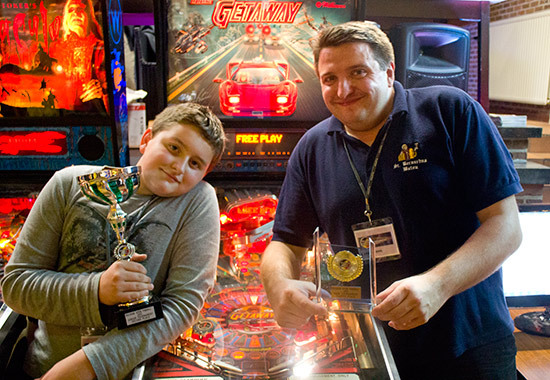 Their scores on each machine were ranked against everyone else who played them, and ranking points awarded. The total of the six ranking points made the player's overall total. In addition to the six games, there was a joker which could be played to try to improve a competitor's ranking. 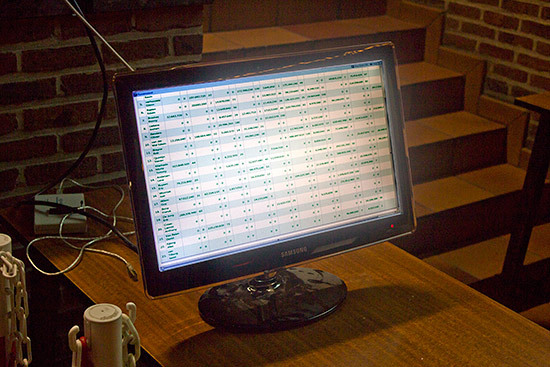 It could either be used to replay one of the six machines - in which case the joker game's score replaced the previous attempt whether it was higher or not - or to play a seventh game, which meant the score which earned the lowest number of ranking points was erased from the records. 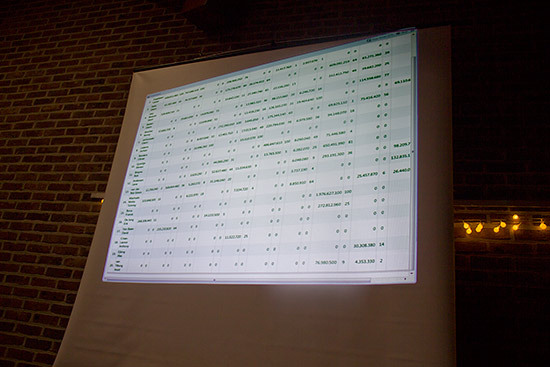 The current standings were shown on a projector screen next to the stage. The numbers were rather too small to see easily but the display was replicated on monitors on the main floor. 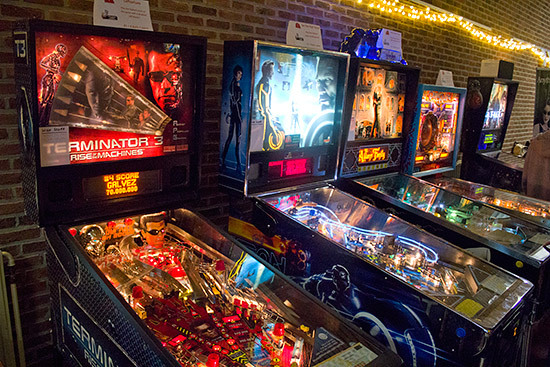 When Sunday came around, some changes had been made to the pinballs. 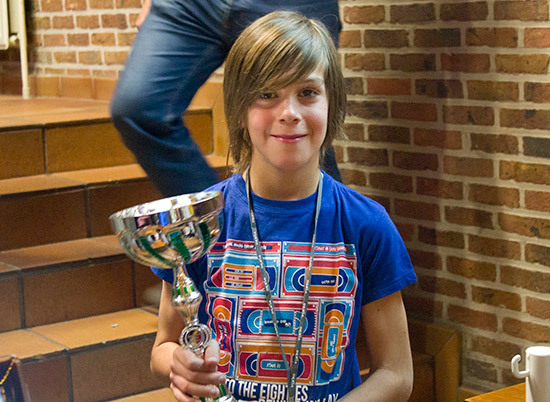 The Tron and X-Men had swapped places, so the Tron became part of the Main Tournament which was run on Sunday by Lieven Engelbeen, and Wolverine joined the line-up for one of the side tournaments. 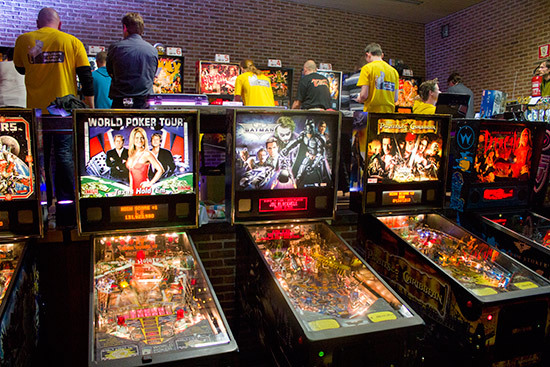 Another eight machines had been added to the Main Tournament selection: Attack from Mars, Monster Bash, Transformers Pro, World Poker Tour, Batman - The Dark Knight, Pirates of the Caribbean, Bram Stoker's Dracula and High Speed 2 - The Getaway. These were mostly the machines used the previous day for the Team Tournament and were positioned directly in front of the stage. Stargate had been taken out of the line-up to go into the general play area and replaced with Attack from Mars. 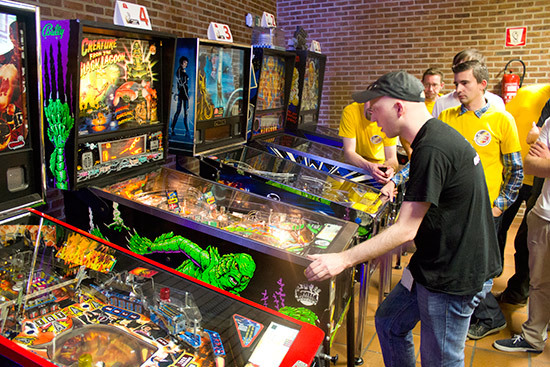 The play-offs followed a double-elimination format where players were paired-up to play best-of-three games on randomly selected machines. The winner moved on to the next round while the loser played in the loser bracket where a single 4-ball game decided who could carry on and who was out. 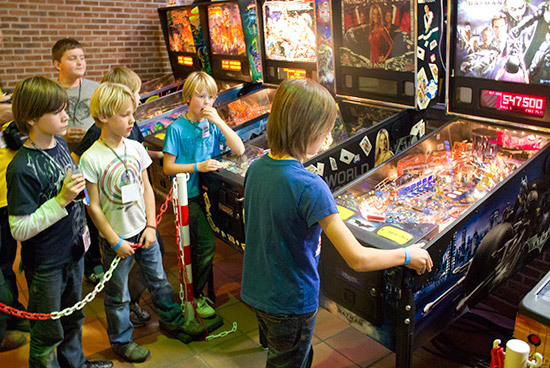 While the Main Tournament play-offs were taking place, the second side tournament - the Youth Tournament - was also under way on four machines located opposite the added Main Tournament games. 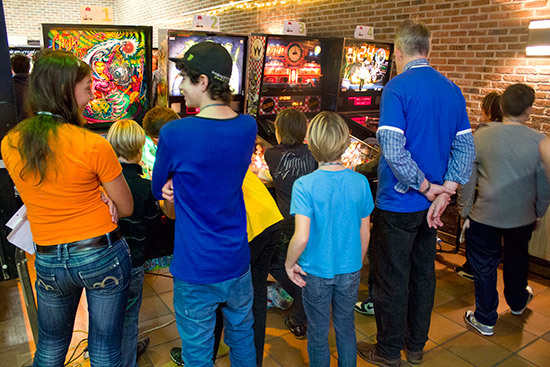 The Youth Tournament machines were: Cirqus Voltaire, Shrek, Diner and 24, and the tournament was run by Evert Brochez. 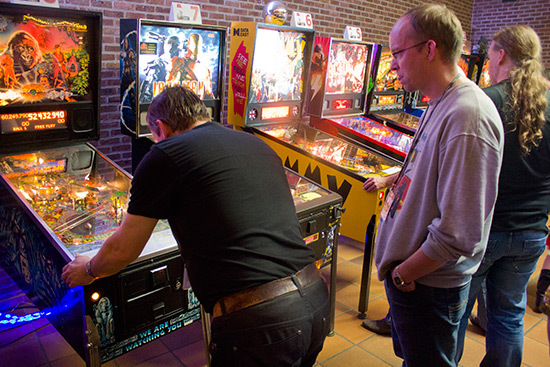 After the qualifying round, the four-way final was played on a Batman - The Dark Knight machine. Taking part were Adam Bona from France and Joren Engelbeen, Korben Van Wonterghem and Thomas Van Clapdorp, all from Belgium. 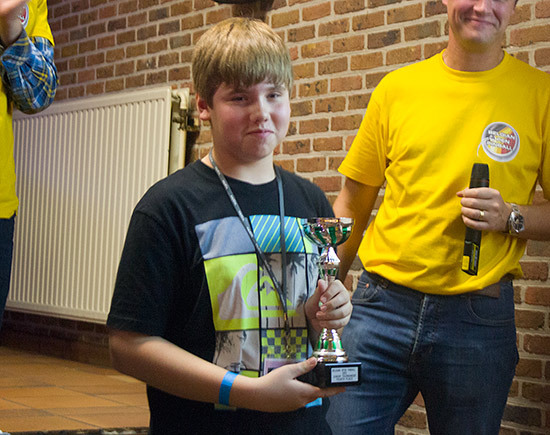 Korben Van Wonterghem took an early lead in the final - a lead he was to maintain throughout, and one which allowed him to claim first place. 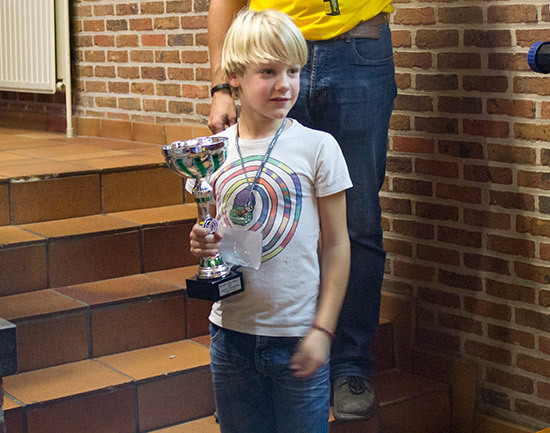 In second place was Adam Bona, with Joren Engelbeen in third and Thomas Van Clapdorp in fourth. Next to The Matrix on the right side of the hall was a row of four machines used for the third and final side-tournament - 'Winner Takes It All', which ran from the show's opening until it closed on Saturday, and from the opening until 4:45pm on Sunday. This tournament was also run by Evert Brochez. 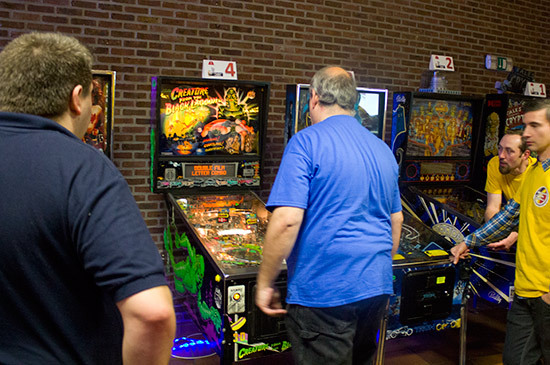 Each machine had a different type of high score competition. The Terminator 3 has the left flipper disabled and so had to be played with just the right one. The Tron was a regular high score challenge. The Addams Family had the flipper area covered for Tommy-like play, while the Devil Riders had swapped flippers but had to be played without crossing your arms. All four Winner Takes It All machines cost €1 for a 3-ball game with the highest scorers on the four machines each day going into the semi-finals and then the final, which were held late Sunday afternoon. 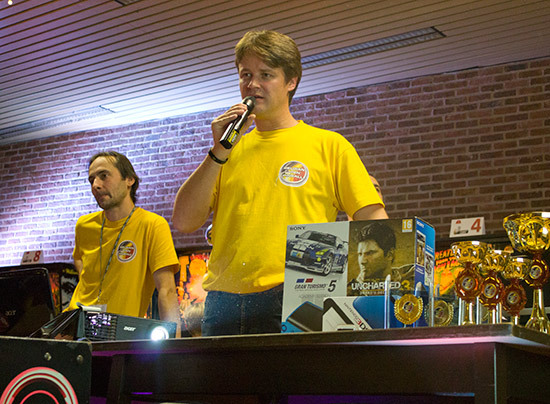 The final four were Roy Wills, Brenn Oosterbaan, Franck Bona and Martijn van Aken. Unfortunately we had to leave for our Eurotunnel train back home so couldn't watch the final, however Franck Bona took the honours and became the winner who took it all. Which brings us to the Main Tournament's final. Roy Wils, Taco Wouters and Martin Ayub all reached the final after winning all their matches. 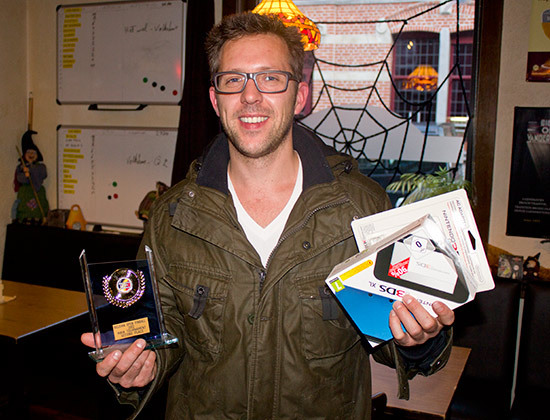 Franck Bona made it into the final as the winner of the loser bracket, after beating Matthew Vince in the play-off. 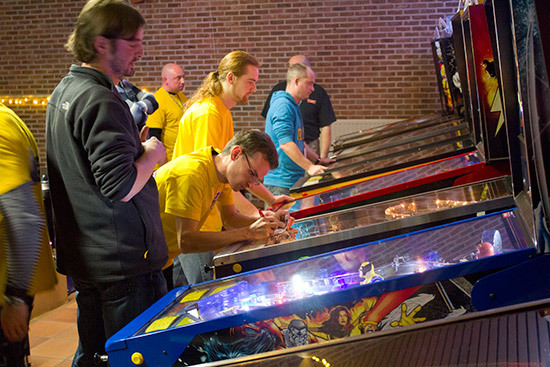 The final consisted of three 4-player games played on machines chosen by the three undefeated finalists. Roy chose Tron, Martin picked Iron Man while Taco selected Rescue 911. 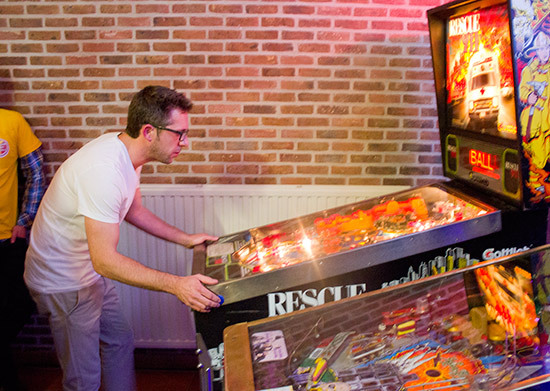 In each case, the player choosing the machine took the player one position, while the other positions rotated between games. 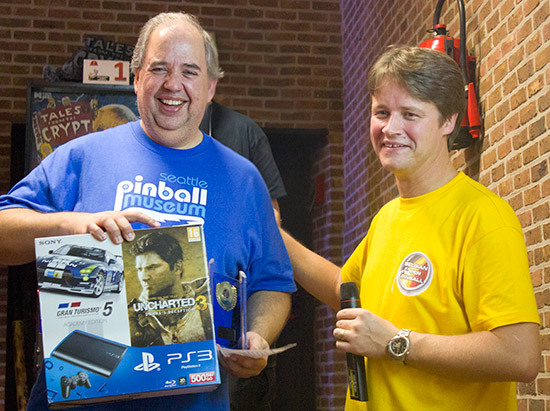 Points were awarded for the finishing positions after each game, with 4 points for a win, 2 points for second place, 1 point for third, and no points for coming fourth. In the first game on Tron, Roy secured a convincing win with 102M to pick up 4 points. Martin was second on 45M, Taco third on 12M, while Franck never had a chance to get into the game and ended fourth on 10M. Martin's choice of Iron Man was next, but it didn't turn out to be such a great choice as he could only end up third with 7.6M. Taco took the honours this time to pick up 4 points for his 28M, with Roy in second on 10.6M, picking up 2 more points. Once again, Franck had no luck and ended up fourth on 5.28M with no points. So, going into the last game of the final, Roy led with 6 points, Taco was second with 5, Martin was on 3 points and Franck on 0 points. Taco began on his choice of machine - Rescue 911. He started with a solid first ball, taking advantage of his familiarity with a game largely unknown by the others. Roy was player 2 and began his game next. Roy held the ball on the flipper for a few seconds while he worked out his strategy, but unfortunately that was long enough for a 'feature' of this particular game to kick in and declare a ball was missing, killing the flippers and draining the ball. This was deemed a serious malfunction which rendered the machine unsuitable for further play, and so Taco was asked to choose a different machine for the last game of the final. After some deliberation he chose Creature from the Black Lagoon, and the final could resume. Taco scored a solid, if unspectacular, 17.3M on his first ball. Roy then took over to play his first ball of three. Roy's start wasn't so good, and his first ball ended with 5.2M on the board. Martin played next and had a more solid start. He ended his first ball with 30M. Last was Franck. He couldn't win the final, but could he overcome his run of bad luck and finally get to have a decent shot at winning a game? Unfortunately, it didn't appear his luck had changed as he languished in fourth place after the first ball. The second ball did nothing much for any player, so the final was to be decided by what happened on ball three. Taco improved only slightly to end just shy of 40M, which gave him a slender lead. If he could hold on it would give him 4 more points to make a total of 9 and give him the victory. Even if Martin overtook him and won, Taco would still end up on 7 points and in a potential tie with Roy and Martin. Roy played next but he couldn't improve his position and was sitting in third place ahead of Franck. Martin played his last ball and boosted his score considerably, ending on 159M - a lead of over 100M and what appeared to be a reasonably comfortable first place. 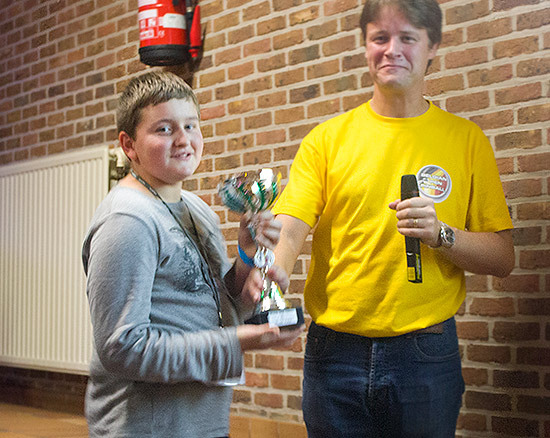 With everything pointing to a 3-way tie for first place, Franck played his last ball of the game, and the final. In a characteristic comeback, he pulled his game back from last place, overtaking Roy and putting him out of the tie-break. But Franck hadn't finished playing, and he continued building his score. Now Taco's second place looked in danger as Franck edged closer and eventually overtook it, to put himself in second place. Could he make up the 100M+ gap and win? Sadly that was asking too much, but his final score of 60M turned around the final positions, as Roy stayed on 6 points, Taco added 1 point to his total to also end on 6 points. 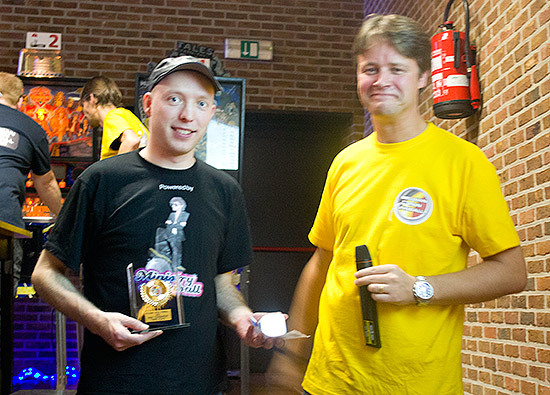 Franck collected his first points with 2 for second place, but Martin added 4 point to his total which gave him 7 points and the title of Belgian Open Pinball Champion. The finishing positions in the third game was the only combination which could give Martin victory, so he gave Franck a big hug at the end of the game, thanking him for making the win possible. There was a play-off for second and third places between Roy and Taco, played on AC/DC. Taco won this one, taking second place overall. Then it was time for the presentation of the trophies and prizes. 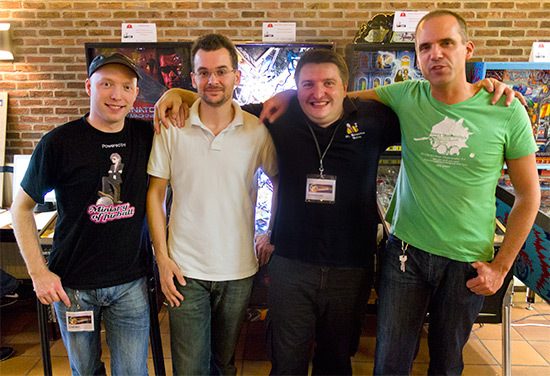 That brings us to the end of this report from the new Belgian Open Pinball weekend. Although there were one or two rough edges such as the score displays, the weekend must be judged a great success with everything appearing to run smoothly, thanks to the hard work of the team planning and running it. They are already working on next year's event and are moving to a bigger venue in the larger neighbouring town of Sint-Niklaas, which has improved catering and accommodation options. 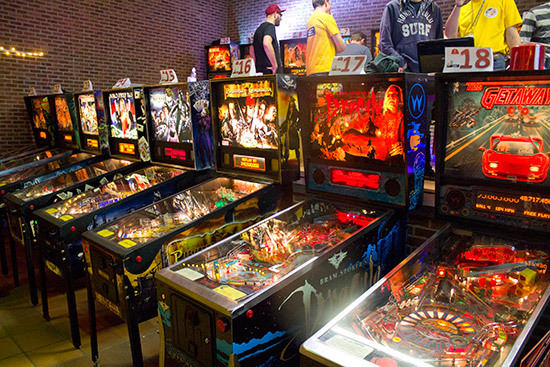 Check the Pinball News Diary page for full details of where and when.